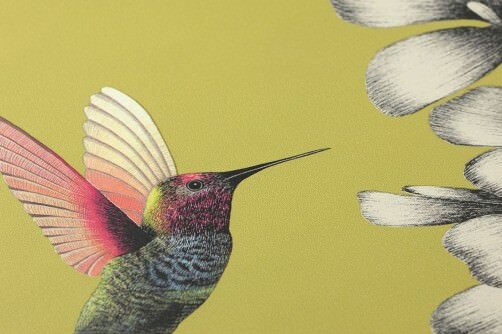 Yellow wallpaper for sunny vibes in the room – buy them online now! Nothing reflects the bright beauty of the colour yellow better than Beethoven’s 9th Symphony “Ode to Joy”. Yellow is vibrant, uplifting, optimistic, euphoric. Yellow wall décor awakens a zest for life and feeds the motivation to reach your goals. It’s a very strong colour, even in its more subtle, delicate or light incarnations. 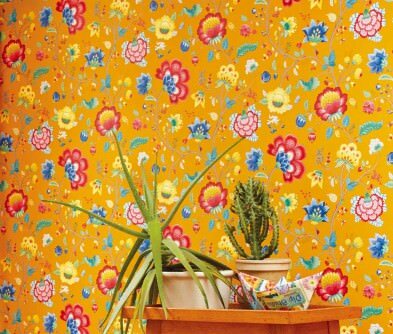 Flower Power, lovingly designed patterns, Mediterranean flair – anything is possible with yellow wall-coverings. They simply fill a room with positive vibes and fantastic new ideas. We’ve rediscovered these natural mood enhancers – exclusively for you! 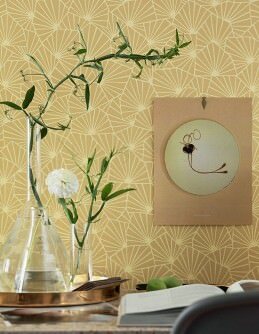 Open the room to creativity and good vibrations – with our gorgeous new yellow wallpapers. Whether you choose a fruity lemon shade or a soft golden hue, our new wall-coverings let your mood reach hitherto unknown heights of sheer delight. Yellow wallpapers lend themselves perfectly to harmonious combinations with other colours. Fans of retro wall décor have a penchant for classic yellow and orange shades in crazy patterns which inspire and energise. The colour yellow makes a room look much larger and fills it with warmth and comfort - discover our new yellow designer wallpapers! Have you ever seen a child’s drawing of the sun? Of course – and it is always YELLOW! 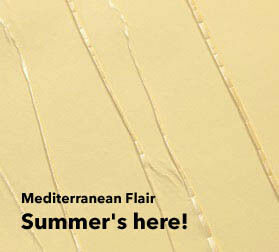 The association is only to clear: yellow wallpapers let the sun come into your home. Fresh, free, and fruity – our new yellow range in all its beautiful shades and hues is stimulating and creates an air of happiness, joie de vivre and renewed energy. Any sad notion is immediately eliminated, and harmony rules once more. 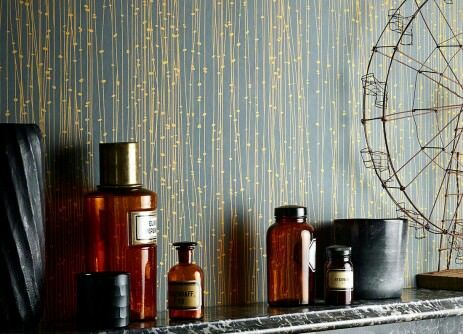 Wallpapers in yellow are truly multifunctional, creating space and light. Check out the glorious variety in our shop: patterned, floral, photo murals, structured and in unique designs. 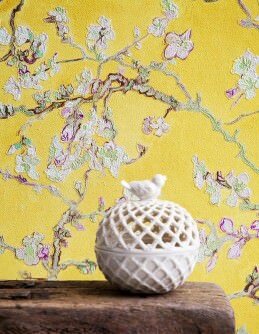 Yellow wallpaper is pure sunshine, regardless of the shade of the yellow base or accent colour. Yellow immediately puts you in a good mood – and that’s because we associate yellow with summer, sun, holidays, fruity lemons and a cheerful disposition. 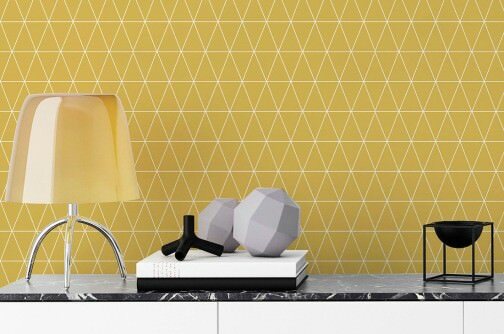 Even more so if we are talking about yellow design wallpapers, which are available in patterns, structures and surfaces that range from lively, romantic and ultra-modern right through to abstract or extravagant. The sun is rising in our Wallpaper Shop and we would love to share it with you – be it at home, in business premises, doctor's surgeries or therapy rooms. Here’s to plenty of fresh fun in your life and home. Yellow is one of the primary colours, and if mixed with fruity red it creates an equally bright orange. Yellow and blue make green, and green is the base colour for many shades of blue-green and green-blue. Brightening intensive brilliant yellow with white generates hues such as pastel yellow, vanilla-beige, and other shades of beige. When mixed with black, yellow turns brownish. Less saturated shades of yellow are known as ochre. Saffron yellow tends to be more reddish-orange, while golden yellow is seen as a very comforting and warm colour. So, there are different shades of yellow, but each one retains its lively, happy, energising and sunny basic mood. As a result, yellow wallpapers energise anyone entering a room adorned in this glorious colour. The colour yellow generally draws attention to itself. 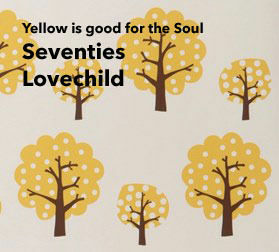 This applies to yellow clothing, yellow cars, yellow sofas – and of course to yellow wallpapers. This is a direct result of all the positive associations and psycho-energetic factors connected with the colour. Yellow symbolises the sun and light. It stands for joy, happiness, cheerful serenity, warmth, and increased brain activity connected to vision, creativity and imagination. Yellow promotes communication and interpersonal exchange. It provides stimulation, arouses interest and can be very inspiring when it comes to solving problems or making decisions. Yellow has a clarifying and sometimes even liberating impact. This colour exudes energy that activates body and soul and, in the form of yellow design wallpaper, it will look fantastic in your favourite room. 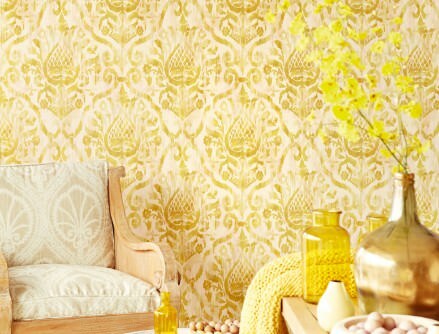 Yellow wallpaper drives away gloomy thoughts and cheers you up. We associate bright lemon yellow with fruity freshness. Together, yellow and orange give a very Mediterranean feel and conjure up images of lush fruit orchards. Yellow is also seen as a healing colour. It is said to have a detoxifying effect on the body and is frequently used to help alleviate liver problems, weak immune systems or rheumatoid arthritis. Yellow gives strength and can support the healing process, promotes optimism and relieves anxiety. People who surround themselves with yellow objects and wallpapers, or wear yellow clothes, have a zest for life and plenty of self-confidence. Let us not forget the signalling impact of yellow. On traffic signs, yellow demands your attention, e.g. on the German "give way" sign. Yellow is highly recognisable and is used as a corporate identity colour by the German and Swiss postal services. The yellow bin (bag) characterises waste receptacles for plastic waste to be recycled. Yellow in its various shades and manifestations is a colour that is shown to advantage in any room and has an invigorating effect. The vitality of yellow can be calmed with wallpapers in pastel yellow or vanilla yellow so that design wallpapers with patterns or structures are also a great option for the bedroom and fitness room. 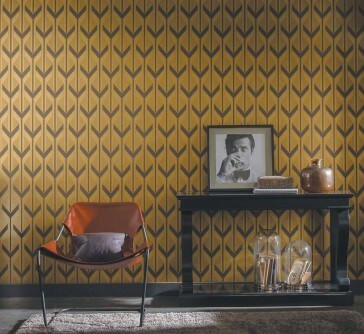 Regardless of whether you are decorating the nursery/children's room, kitchen, dining room, bathroom, guest toilet, office, corridor, hallway or stairway – they all benefit equally from sleek, elegant, trendy or sophisticated yellow design wallpaper. If tired staff are to remain fresh and alert during lengthy conferences and meetings in order to contribute clear thoughts and great ideas, yellow design wallpapers are the right tool for this. Yellow wall décor also makes rooms appear bigger and more open, allowing you to balance an unfavourable room layout. 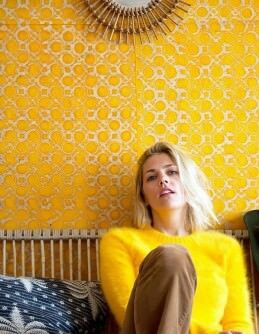 Yellow wallpapers are real pick-me-ups for any room. The special selection of base and accent colours in our Wallpaper Shop enables you to decorate rooms in many styles and preferences. You can create any look - from exquisitely fresh and sunny romance right through to extraordinary geometric creations. Discover the various effects that you can achieve, for example by combining white or light base colours with vibrant yellow or multi-colour patterns that include yellow. 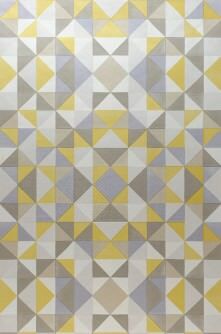 Darker base colours (such as shades of brown or blue) enable you to stage yellow patterns with a maximum of contrast. Stripes of sunny yellow and cool turquoise immediately make you think of a trip to the beach. Golden-yellow base colours with a white pattern represent a clear and very modern look. 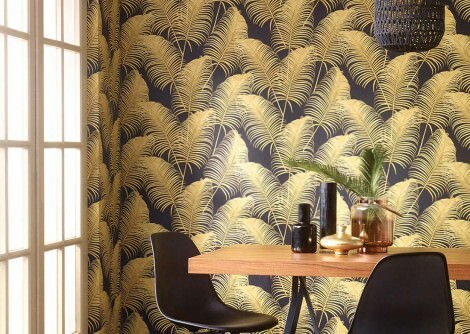 Patterns, motifs, and structures that beautify walls with their clear, complex, graphic, retro, abstract, stylised romantic and three-dimensional properties: yellow design wallpapers in all their variations and designs express pure zest for life. Shiny and metallic surfaces catch and reflect the sunlight, producing charming and spectacular effects. Baroque wallpapers and gold – a real classic for a majestic space. Try combining gold and yellow – this unique colour and pattern mix gives an airy feel to heavy baroque patterns. Let’s now get aboard the Beatles’ legendary Yellow Submarine and travel back to the crazy latter half of the sixties, where fluorescent colours as well as geometrical and abstract patterns revitalised the drab monotony of everyday life. 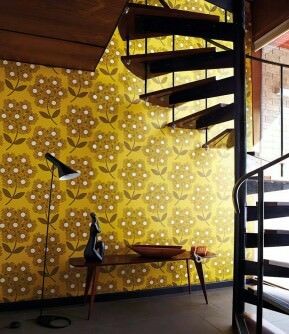 With yellow vintage wallpapers from our Wallpaper Shop, you can recreate this unique retro feeling on your walls and enjoy the imaginative creations for many years to come. How about watching the famous Beatles movie and let pop history's unique fairy tale take you to a groovy, colourful world of escapism. Yellow makes kids happy, promotes play and stimulates the exchange of ideas – thus making it a great option for the nursery/children's room and a wonderfully fresh and fruity alternative to the traditional pink and light blue. New yellow trend wallpapers allow you to create feature walls and play areas, can be used to prettify wardrobes and chests of drawers, make the nursery/children's room appear sunny and will make your children's eyes light up every single day. 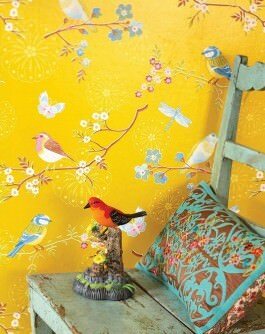 Many children's wallpapers in our multi-coloured pattern range contain plenty of yellow. This presents children and their parents with a choice: full-on sun or discreet highlights of freshness with yellow spots of colour. Low or high dose? How much space should be taken up by yellow wallpapers? Whether to decorate an entire room or just a feature wall with yellow design wallpaper is not just dependent on the colour alone. Other factors such as pattern type, pattern size, room size, amount of daylight, and furnishings should also be taken into consideration. Remember that geometrical and abstract large patterns (e.g. retro patterns in the style of the Sixties or Seventies as well as opulent flower or baroque motifs) are very dominant and require a large space. It is fully sufficient to have just one feature wall in order to enjoy the vivid and fresh beauty of yellow wallpapers. 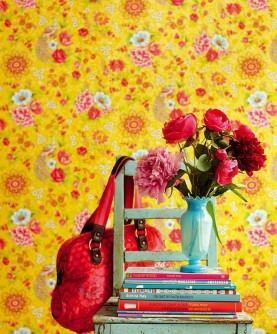 If your chosen yellow design wallpaper boasts delicate designs, clear and small geometrical patterns, or tonal patterns, it may be used to decorate all walls in a room. However, make sure that the furniture and furnishings produce a harmonious effect and avoid colour contrasts that are too pronounced. Take up colours from the design wallpaper of your choice and hold back when it comes to mixing. You will achieve total harmony by combining yellow wallpapers with warm, reddish and darker woods. It's as if you were hugging and caressing your yellow wallpaper. The successful contrast provides a maximum of cosiness and warmth. Ideal partners include mahogany, walnut, cherry tree and teak. Beech wood with its yellowish-reddish colouring is also suitable. As an alternative to wood, you could opt for furniture and furnishings with white or patinised surfaces or materials that shine like gold.